First, we will deliver the bad news: Readmission rates for congestive heart failure (CHF) patients hover near 25%. The good news? A recent study chronicled in the Journal of the American Medical Association (JAMA) found that effectively reducing those readmission rates does not have to come at the price of compromised care. The article, addressed the decrease in 30-day readmission rates for heart failure patients as compared to mortality rates within that same patient demographic. The catalyst for the study was the fear that government penalties assessed for excessive readmissions would affect care decisions. For instance, staff opting to send a patient home from the emergency room despite symptoms that warranted readmission. This philosophy is the backbone of Get Real Health’s product, Ellie, which provides the tools for the “patient centered care” cited in the article. Readmission rates for heart patients have long been tied to lack of medication adherence, spotty follow up care and inadequate discharge instructions. Having systems in place that address these issues can be the difference in a hospital being penalized or rewarded for readmission statistics. Ellie is uniquely positioned to provide the technology to help people control and treat congestive heart failure at home thus decreasing the risk of costly hospital admissions. Patients complete tasks, track symptoms and medications and record data from either connected or non-connected devices. Better yet, all this data can be shared with caregivers in real time with the ability to securely message back and forth when necessary. The JAMA cites the need for physicians to continue the “important work of helping patients transition safely from hospital to home.” That transition should include a care plan with clear discharge and follow-up instructions. 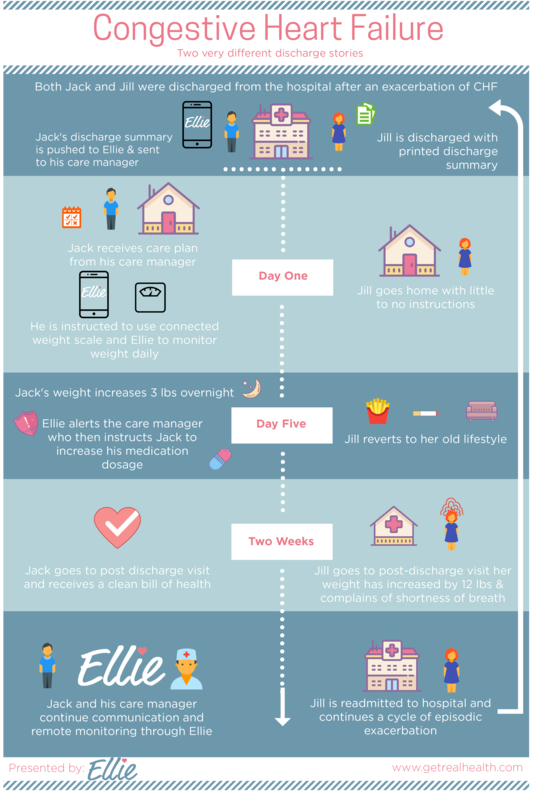 Using Ellie’s self-management action plans, providers can give their patients easily actionable tasks to complete at home to remain compliant with medications and plans of care. Comprehensive features such as a personalized health journal functionality allows for immediate capture of symptoms and concerns. Additionally, markers like weight and fluid balance can be configured to trigger an alert if they fall out of a pre-set safe range. Also, Ellie helps aggregate patient-generated data with uploads from devices as well as information from physicians and facilities in one place. Much like seeing a patient for an office visit without the time and expense.